The Minnesota Forecaster: Might We REALLY Warm Up Next Week? 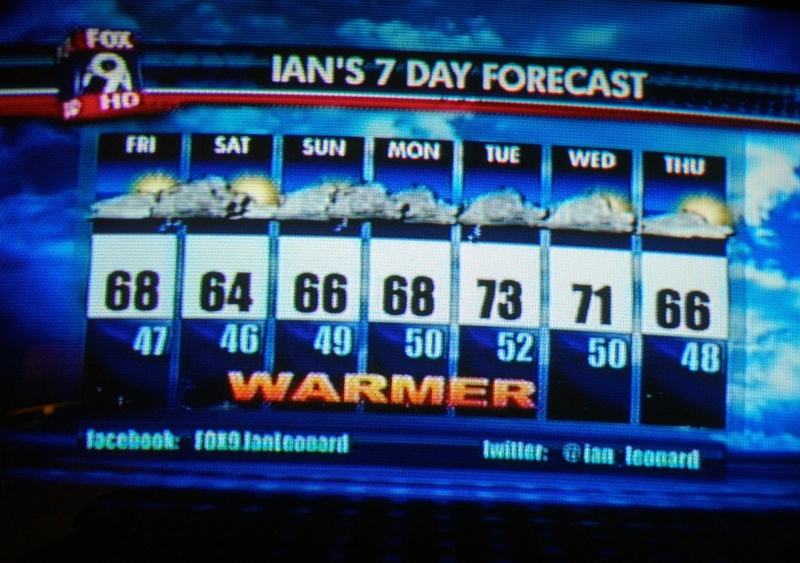 These temp predictions are rather conservative. Ridge builds over the central U.S. & jet migrates into northern MN & Canada bringing warm air north into southern MN. Keep in mind, our average high temp is near 70 by the weekend. To think that temps will be slightly above avg. is conservative. We should easily see an 80+ reading by Tue or Wed. along with strong T'Storms. 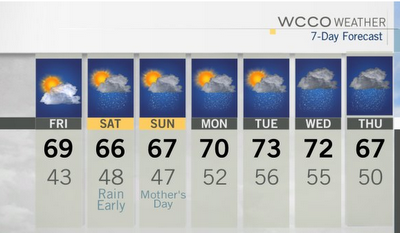 Here's a trivia question for you all,what is the latest date of an 80 degree high in spring at MSP,heres hoping our streak of non-80 contiues(best shot will be Tuesday,Wednesday there will be too many clouds)I'm loving Thursday and into next weekend,some below average temps coming(fishing opener looks like highs struggle to get to 55),as far as I'm concerned heat and humidity can stay away,the further they are the chance of severe weather stays away and everyone feels comfortable,mother natures very own air conditioner coming Thursday and beyond(may have frost issues Fri/Sat. night of next week,lows dipping into the 30's close to the metro,for sure in the suburbs). I will probably go with sometime in late May. Speking of rain, I find myself eyeing a potential severe weather event on monday. The warmest it's been this year so far at MSP was on April 10th, with a temp of 76 degrees. I'll keep searching to see if I can find that latest 80 degree date as MSP on record. This info may only be available in house at the NWS, but I'm not sure. I came in here just to note that NWS LaCrosse is calling for 81 on Wednesday in Lake City. YMMV. Latest 80 degree for MSP on record is June 12th (happened in 1924 and in 1935). Thanks! Is there a website that has that info, or how did you find that? 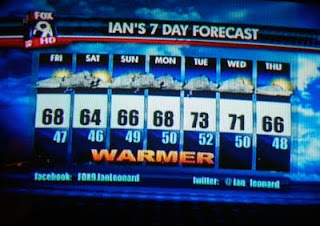 Novak is looking really good with the Tuesday forecast he made on Friday. Go Tom! You have to like the set-up for severe wx later this afternoon & evening. The only thing that may be lacking is twist and/or shear up above. Otherwise, CAPE & Lifted Index levels are thru the roof. If we can break the CAP, storms will go up quickly and become strong within minutes. RUC showing capes of 7000 over southern Minnesota. Its a high risk day if there is a bit more wind shear. Still could be some massive hail don't you think? Lapse rates of 7C in the midlevels. Surprised that SPC only has us in a 15% hail risk. I came in here just to note that NWS LaCrosse is calling for 81 on Wednesday in Lake City.